Check out this Large Metal Penscript Words and Phrases JUST $24.99 (Retail $64.99). Every year I choose one word or phrase when I'm making my New Year's Resolutions (remember yours?) to remind me how I want to improve my life. Last year it was SIMPLIFY. This year is CONNECT. Others that I have used are CREATE and LOVE. This has been an incredible way for me to remind myself in a simple way about the theme of my goals for that year. These have been great for my kids too! What's your mantra? If you had a keyword or phrase for your life right now, what would it be? These go beautifully in a gallery wall, above a doorway or next to an entrance or exit to any room. Want to make a phrase? See the power of words like "I am Enough" or "Be The Good" change your life (be advised that the words will be connected as one phrase, not cut separately – no spaces). 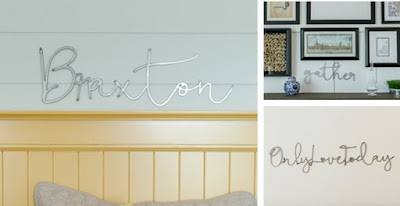 These incredible metal words and phrases can be decorated any way you prefer or you can simply leave them raw and beautiful! Custom words and phrases will range (sometimes dramatically) in size up to 12" tall x 24" long depending on character count (The shorter the word the taller the piece, the longer the phrase, the shorter the piece). Choose your favorite saying, affirmation, word, or date - Up to 13 characters.